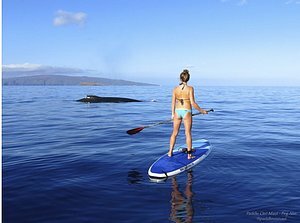 Paddle On Maui - Offers guided group and private charter paddle board and kayak tours in South Maui. Their tours are suitable for beginners and you have the option of booking snorkel tours, whale watches and SUP yoga. 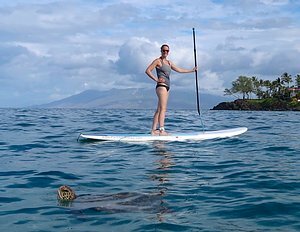 Turtle Town SUP Rentals - Availabile in South Maui for 1 or 2 hour rentals for experienced paddlers. You'll have a board delivered to you, assistance in and out of the water by a professional, and their guidance where to find our charming Green Sea Turtles. Wailea Scuba Surf & Paddle - With 20 years serving clients in South Maui for a wide variety of ocean based activies this is a great place to find an expert guide who will custom taylor a tour to meet your needs whether it be on SUP or Kayak. 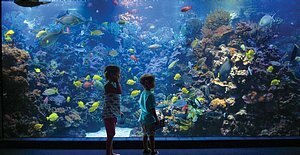 Maui Ocean Center - Ranked one of the worlds top 10 aquariums it's a great way to spend a rainy day or to relax in the a/c while wandering around 60 exhibits of native Hawaiian species, live reefs and the new interactive Humbpack Whale exhibit and sphere. 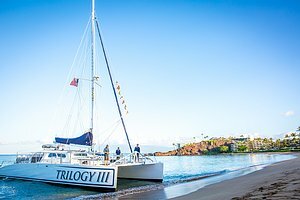 Trilogy Excursions - Serving South and West Maui for 45 years if you're looking for an amazing snorkel trip, dinner cruise or whale watch this family business is well-known on the island for providing not only quality, educational tours, but being very responsible on the water, supporting the local community and preserving the ocean environment. Beautiful Maui Vacation Rentals - For luxury accommodations in a spectacular location close to pristine beaches and the Shops of Wailea these condos offer it all. They are situated in the Grand Champions Villas complex with 12 acres of tropical landscaping, 2 pools and spas and easy access to both golf and the tennis club. Alii Resorts - Offering vacation rental options in Kihei, Wailea and Makena they act as your personal concierge and will work with you prior to your arrival to plan a range of services, activities, experiences, and excursions. 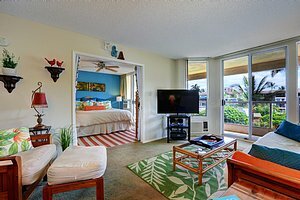 If you're looking to stay centrally located in Kihei just steps from the beach this newly decorated unit features modern beachy decor and all the comforts of home along with ocean views enjoyed from the lanai. Coconuts Fish Cafe - Serving fresh fish, salads and homemade sauces it's a family friendly favorite for both locals and tourists alike at both of it's Kihei locations. Cafe O'Lei - Offers a variety of lunch and dinner menu items at reasonable prices for the family including salads, seafood plates, chicken/steak and sushi. Conveniently located in the Rainbow Mall. Sansei Seafood Restaurant and Sushi Bar - A great option for sushi lovers as they have a very large selection of fresh fish to choose from as well as other soups, salads and dinner entrees. Reservations recommended. Monkeypod Kitchen - In the heart of Wailea for those looking for a more upscale dining experience for lunch or dinner they have a delicious menu supporting local and organic farming, ranching and fishing. Fork & Salad - Soups, Salads, sandwiches and a kids menu showcasing a farm-to-table cuisine supporting local farmers, ranchers and fishermen. Nalu's South Shore Grill - An open air, family friendly restaurant for breakfast, lunch and dinner they serve locally sourced recipes with daily specials and live music in the evenings. Fabiani's Bakery & Pizzeria - Serving authentic homemade Italian cuisine in both their Kihei and Wailea locations it's a reasonably priced choice with excellent food and service and reservations not required. They also have a large selection of fresh assorted delicious baked goods.